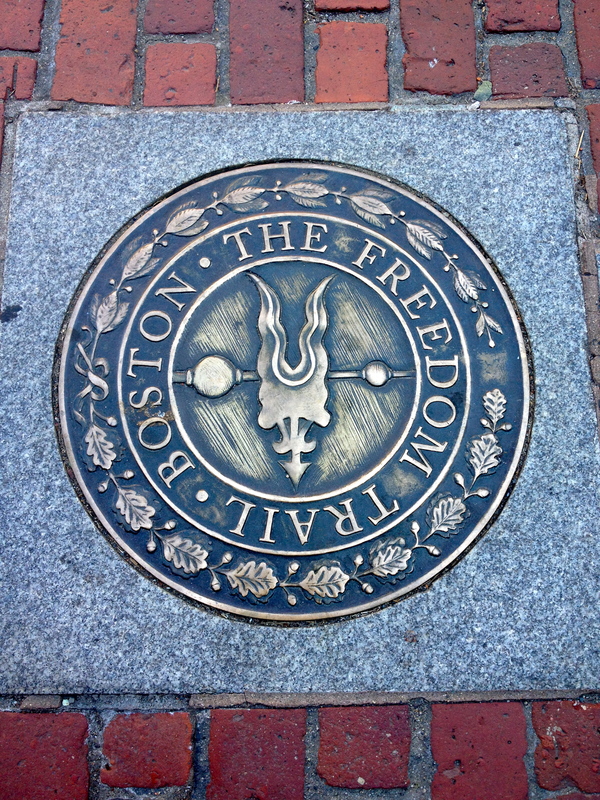 Our first full day in Boston was May 6th, and loaded with Boston’s rich history. We started off the morning with a quick breakfast at Quincy Market before beginning the busiest day of our trip. After breakfast, we went to the Old State House to do a self-guided tour. The Old State House is a very important part of the history of the United States, and many significant events leading up to the American Revolution took place there. It was built in 1713 and serves as Boston’s oldest public building. The Old State House was once one of the tallest buildings in Boston but is now surrounded by the towering buildings of Boston’s financial district. The council chamber is where James Otis argued the Writs of Assistance case in 1761 and also where John Hancock was inaugurated the first governor of Massachusetts in 1780. The balcony outside of this room is where the Declaration of Independence was first read on July 18, 1776, and the balcony also looks over the site where the Boston Massacre took place, which is marked as seen in the following images. After exploring the Old State House museum we went over to the Boston Common to begin the Freedom Trail Walk Into History Tour. We walked through the Boston Common and then headed past Park Street Church, which was built in 1809. Our next stop was walking through the Granary Burial Ground, which was founded in 1660. Within this burial ground rests many significant patriots who helped to build America. The Franklin monument in the center was erected in memory of the parents of Benjamin Franklin. The tombstones of some of the notable patriots in the burial ground can be seen in the images below. A memorial was erected to honor John Hancock, and James Otis and Samuel Adams are also buried there. Paul Revere was buried there in 1818 and his original tombstone can be seen below on the right below. The larger monument on the left was later erected in order to honor Paul Revere. Below that image is the tombstone that marks the spot where the victims of the Boston Massacre are honored. We passed King’s Chapel and the Old City Hall before concluding our tour at Faneuil Hall. We had a wonderful tour guide who gave an excellent background on Boston’s history, and it is a tour I highly recommend to cover the important historical landmarks throughout Boston. Since this was such a fun-filled day I will continue tomorrow with our tour of the North End and more!